It's Friday AND a long weekend! Life doesn't get much better than this. Oh wait, it does! We are going to Disney in less than a week! I am so looking forward to a long relaxing weekend followed by a short work week that leads to another long weekend in Disney. Life is good. Over the weekend I had both machines running at the same time. I was so worried that while I was tending to one machine would mess up, so needless to say this lasted a whole five minutes. 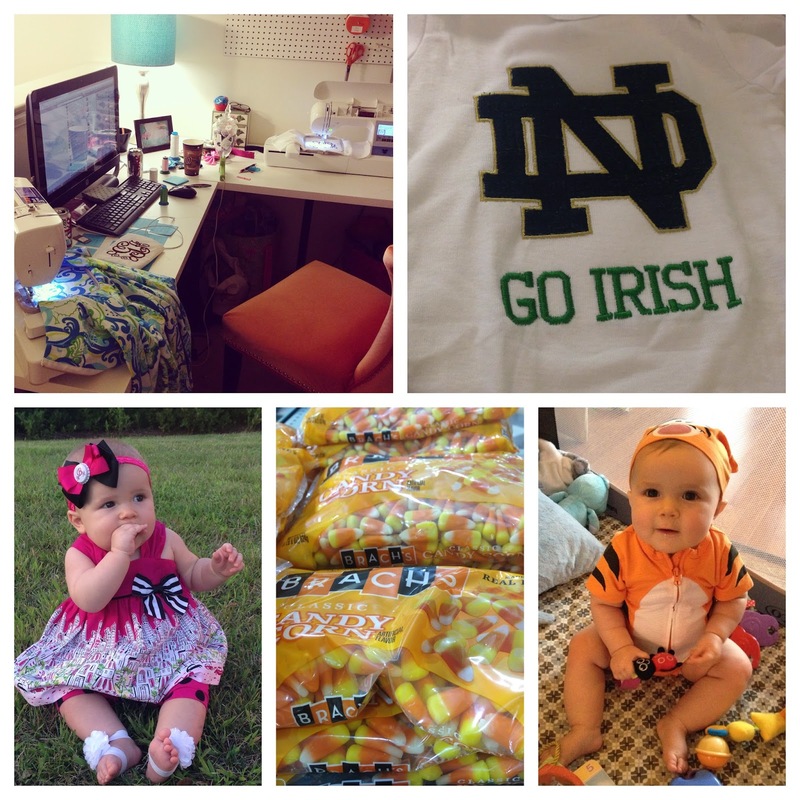 Tomorrow is Notre Dame's first game of the season so of course, Charlotte needed a shirt to show her team spirit! Candy corn is here!!! The girls I work with and I can crush bags upon bags of candy corn during the fall months. It's so bad but oh so good! Since we are going to Disney next week, I have been pulling out Disney outfits to help make packing easier. Of course, sometimes we have to play dress up, like when I found this adorable Tigger outfit complete with a Tigger hat and tail! We're excited for football season at our house!! Here's to hoping ND has a great season :) Go Irish!! Visiting from the link up! I've never been a huge fan of candy corn, maybe I'm just not trying the right stuff but to me it just tastes like sugar with a weird texture! Wishing everyone a very happy weekend travel.